My dad was 28 years old back in the summer of 1980. He had been married for a couple years already and had finished up both college and seminary. He was about to take his first church on full time way up in the frigid tundra of South Dakota. That summer I was born and I don’t remember any of it. But what I do know is that 28 years later, in the summer of 2008, I celebrated my 28th birthday with my wife for the very first time. We didn’t (and still don’t) have any kids, nor have I or she finished grad school but my life, right now, is in the arena that my father’s was when I was born. This is the first year of my life where I felt as if I was on par with my father for the first time. He was always (for as long as I’ve known him and have been alive) a grown-up while I was still a kid. Looking back on 2008, now that it’s a pinch behind us now, about four weeks and a couple days to be precise, I am proud to say that my first year as a married man was a really good year. I know I have a history of lamenting on my good years every January or so and spouting out my eternal optimism for the coming year but I don’t feel bad about that because so far I feel that every year has truly been better than the year recently ended. 2008 not only was my first year as a husband. 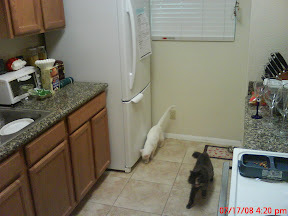 Flor and I also adopted 2 cats and became quasi parents of two little ones named Esther and Fred (Freddie). We even took advantage of the horrendous economy and market conditions of the times and purchased our first home, a small one bedroom condo out in El Cajon, just East of San Diego. Flor and I even endured about 26 days of separation in the summer due to a school term she had to attend in Washington DC and we experienced our first ever phone bills exceeding our allotted monthly minutes. :) We ogled the capital together with my sister and road tripped the United States all the way back to San Diego. After returning home I would have made my Grandfather proud surely by becoming the handyman that that he would have admired. I’m sure he would have loved helping me and Flor fix up our place. Having said that however, I think maybe he might have helped us out some way along the way anyhow, who knows. We painted walls, patched holes, changed light fixtures, installed hardware, and as the year turned we even fixed our ceiling and roof (minor repairs mind you, nothing to get too exited about). 2008 even brought with it my return to school as I did the bulk of a Master’s program between my regular work and bowling excursions. And Flor’s schooling has made great progress and makes me so proud to call her my wife. She started going to the hospital once every couple weeks shadowing doctors and seeing real patients. She’s so cute in that white coat. :) I swear she’s going to make a fine doctor, one of those doctors that everybody loves, the kind that seem to love what they’re doing. All in all Flor and I had a remarkable year in 2008. Sure retirement accounts fell precipitously, as did everybody’s, and there were stressful times at work and at home but the smiles and happy times were much more prevalent. We even found ourselves peering into the small little eyes of a new baby nephew and received word that another nephew/niece is on the way. Flor’s family has been blessed with little ones and we’ve had the good fortune of being the fun aunt/uncle coming to town to entertain the kids. It’s been really cool to be in that spot… and then we get hand the baby back over to mom when the little guy poos. :) The point here however is that I feel like I’m an adult now and that my life is good and in order. I have my wife and all of my friends and family to thank for that because really, it doesn’t feel like I did anything to make this happen. I hope my dad understands that though he is now twice the age (and maturity surely :)) that he was when I was born, I am now infinitely more mature than I was then, just 28 years ago… or even a few years ago for that matter. For the first time I feel like I can walk side by side as equals with my dad, and his dad, and his dad. They were all great men and one day I hope to be a great man as well. In 2009 I look forward to all the things that might come our way. I should graduate while Flor will be spending many of her days in the hospital. Our little kitties will both turn one. Happiness and comfort should abound, and surely many unforeseen happenings will direct our lives… but hopefully with a little luck 2009 will turn out even better than 2008 and we’ll have many more happy stories to tell in the years to come.